The Army’s framework for exercising mission command is the operations process–the major mission command activities performed during operations: planning, preparing, executing, and continuously assessing the operation (ADP 5-0). Commanders, supported by their staffs, use the operations process to drive the conceptual and detailed planning necessary to understand, visualize, and describe their operational environment; make and articulate decisions; and direct, lead, and assess military operations. The activities of the operations process are not discrete; they overlap and recur as circumstances demand. Planning starts an iteration of the operations process. Upon completion of the initial order, planning continues as leaders revise the plan based on changing circumstances. Preparing begins during planning and continues through execution. Execution puts a plan into action by applying combat power to seize, retain, and exploit the initiative to gain a position of relative advantage. Assessing is continuous and influences the other three activities. Both the commander and staff have important roles within the operations process. The commander’s role is to drive the operations process through the activities of understanding, visualizing, describing, directing, leading, and assessing operations as depicted earlier. The staff’s role is to assist commanders with understanding situations, making and implementing decisions, controlling operations, and assessing progress. In addition, the staff assists subordinate units (commanders and staffs), and keeps units and organizations outside the headquarters informed throughout the conduct of operations. 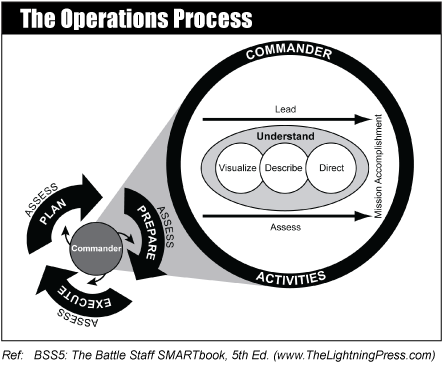 The operations process (ADP/ADRP 5-0) is covered extensively in BSS5: The Battle Staff SMARTbook, 5th Ed. (Leading, Planning & Conducting Military Operations). Material referenced includes 12 pages of the fundamentals of the operations process, 14 pages on commander’s activities (understand, visualize, describe, direct, lead, assess), 20 pages on planning, 6 pages on preparation, 14 pages on execution, and 8 pages on assessment. Additional topics and content in BSS5: The Battle Staff SMARTbook, 5th Ed. include chapters on the military decisionmaking process and troop leading procedures (FM 6-0 w/c2: MDMP & TLP); integrating processes and continuing activities (IPB, targeting, risk management); plans and orders (WARNOs/FRAGOs/OPORDs); mission command, command posts, liaison (ADRP 6-0); rehearsals & after action reviews; and operational terms and military symbols (ADRP 1-02).